Why use a toner? People often underestimate the value of a toner because toners are a mystery to most people. Aside from relieving your skin of further makeup and cellular debris, toners give our skin a pH balance. Our skin should stay between 5 and 6 pH. After cleansing, the pH balance gets disturbed and when this happens it has to work harder to regain its� balance, which can also mean it will produce more oil. Using a toner helps to restore the balance quickly. JES Organics toners have humectant qualities, which mean that they help to bind moisture to the skin. Our toners also have fruit extracts that exfoliate the skin of dead cells and moisturizing properties. We recommend that if you don�t want to wash your face in the morning, use a toner to get the oil or dirt off of your skin. Your skin will feel fresh, softened and revitalized. Directions: After cleansing face, apply a moderate amount of toner to a cotton ball and gently apply all over the face in upward motions. Allow to dry, and follow with the complete JES Organics skin care regime. Often called �The Miracle Plant�, promotes new skin growth, moisturizes, protects and counters the effects of aging, soothing, emollient, anti-bacterial, heals skin irritations, burns and wounds. Aloe Vera improves hydration and is soothing and healing to all skin types. The effectiveness of Aloe Vera gel as a cosmetic skin care and pharmaceutical product is indisputable. It has also been shown to have an invigorating effect on skin when applied on a regular basis. Chemical analysis has shown the presence of mucopolysacharides, a natural moisturizing factor. Aloe Vera is composed of water, the enzymes catalase and cellulose, minerals, calcium, aluminum, iron, zinc, magnesium, sodium, 20 amino acids and carbohydrates. Aloe Vera also contains the "youth mineral" potassium. Alpha Hydroxy Acids(Organic Bilberry Extract, Organic Sugar Cane Extract, Organic Sugar Maple Extract, Organic Orange Fruit Extract, Organic Lemon Extract, Organic Cranberry Extract) skin-conditioning agents, help promote younger looking skin and help to minimize the effect of aging. Help to exfoliate the skin of dead cells; they also have a moisturizing effect on the skin, by increasing the moisture content of the upper skin and so smoothing out fine lines and wrinkles, as well as reducing dryness and combating flakiness. Long-term use of low concentration AHA's can also increase collagen and elastin synthesis, and also boost protein regeneration in the skin. An intriguing finding in some DMAE studies was that it reduced the accumulation of lipofuscin deposits inside cells. Lipofuscin deposits are cellular pigment consisting of aggregated chucks of molecular waste. 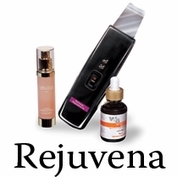 It has been demonstrated that DMAE causes some degree of skin and pore tightening. DMAE in skin care products shows remarkable effects when applied topically to skin, resulting in the reduction of fine lines and wrinkles. Even though DMAE can't fully reverse the existing facial sag, it may reduce its further progression. People report a cumulative effect with continued use of DMAE. DMAE also may stimulate the synthesis of phosphatidylcholine, an important component of cell membranes. Phosphatidylcholine is an essential fatty acid that improves and protects cell membranes damaged by free-radicals and improves blood flow and circulation. Glycerin is a soothing, humectant which draws moisture from the air to the skin. Glycerin is an emollient, which makes the skin feel softer and smoother, reduce rough feeling, cracking and irritation. Glycerin has a high hydrophilic (water) factor and a low lipophilic (fat) factor. Nontoxic, nonirritating and non allergenic. Strengthens epidermis function, aids epidermal circulation. Stimulates connective tissue, elastin and collagen. Lightens skin pigment. Known for its cleaning, antiseptic & stimulating properties. Smells great too! Directions: For best results, after cleansing, apply to your face, neck & decollete area. Discontinue use if you experience any skin irritation. For optimal results, use the complete JES Organics six step skin care regime. Organic Aloe Leaf Juice, Rose Flower Water, Phenoxyethanol, Glycerin, DMAE Bitartrate, Organic Sugar Cane Extract, Organic Bilberry Fruit Extract, Organic Sugar Maple Extract, Organic Orange Peel Extract, Organic Lemon Peel Extract, Organic Cranberry Fruit Extract, Organic White Willow Bark Extract, Tea Tree Leaf Oil, Polysorbate 20, Organic Alcohol, Tetrasodium Glutamate Diacetate. 91% Organic Content.